BEFORE: Philip Seymour Hoffman takes the leading role and Sidney Lumet (Dog Day Afternoon) takes the director’s chair for his final film, Before the Devil Knows You’re Dead. AFTER: I am a big fan of non-linear storytelling. Flashbacks or otherwise non-chronological events have a tendency to make a film that much more exciting to watch because it adds a level of complexity. As a viewer, this requires you to stay alert and be actively piecing together the different scenes. 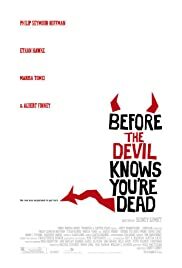 Before the Devil Knows You’re Dead presents an interesting dilemma because the complexity from the non-linear style detracts from the story instead of drawing your attention. It felt a lot like Memento even though the whole film was not told in reverse. But this feeling of constant temporal changes could have been dealt with a bit better. It’s not the worst use of non-linear storytelling I’ve seen but it made an otherwise great story into just a decent one. Besides the story, there’s also the acting to consider. Yet again, Philip Seymour Hoffman delivers a great performance as does Albert Finney (last seen as a cameo in The Bourne Legacy). Ethan Hawke was a bit so-so; definitely subpar compared to Training Day. I must note that there were some scenes, even with Hoffman, that seemed a bit forced and unnatural for the actors. These were few and far between but I’d be remiss if I didn’t mention it. Before the Devil Knows You’re Dead is an interesting non-linear crime drama. It features some great acting and a generally good story that’s marred a bit by editing.